So many people are trying to switch to more natural products, there’s a lot more out on the market to buy. I can’t say I’m someone who’s seeking to specifically change, but where there’s a benefit to doing so, I’ll give things a go if they’re going to work for me. Deodorant is always on my mind though. Cancer has been prevalent in both sides of my family with my mum dying of secondary breast cancer (ending up as a brain tumour and lung cancer). 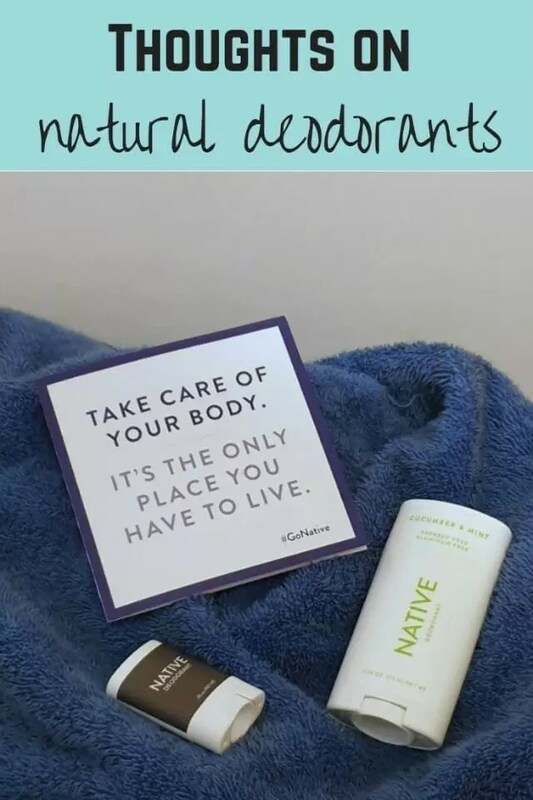 With antiperspirants having toxins in that have been rumoured in the past to cause breast cancer, Alzheimer’s and other illnesses, it seemed worth trying to go more natural. I had nothing to lose anyway. My only issue is that I’m not one of these people who don’t seem to sweat. I do get hot, and I do sweat, especially in summer or while doing exercise. So I need a deodorant that is going to work and prevent me getting smelly. The thought of giving up antiperspirant was a concern as I thought I’d get a hot sweaty mess (even more so than usual) in the summer. I decided to try and break myself in gently by starting mid-autumn, and through winter. Hopefully by summer I’d have found a natural deodorant that worked for me. There are methods to make your own deodorants. Here’s 3 deodorant recipes and background to making them. But I’m lazy, and would rather just look for one that seems to be popular and that I can buy. It’s not easy to decide what to use unless you have friends who can recommend them, or can find health stores which stock them. Buying online means you can’t try them first. Natural deodorants don’t tend to be cheap. Often you’re having to buy from overseas, which means you can end up paying expensive import taxes (I got stung for nearly £15 after ordering only £20 of deodorant which came from the US. In future I’ll order 1 at a time to avoid the charges. There are lots of options out there. I looked up some of the Top # natural deodorant lists, looked at reviews and took my chances. First I ordered Pitrock in roller and spray form. I decided to try the non-scented Pitrok crystal deodorant, having decided that the roll on would last for ages. Although it seemed like a faff to have to put it on straight after the shower with wet armpits, it wasn’t too much hassle. It dried fairly quickly and I didn’t feel wet when I put my clothes on. Pitrok say that their original deodorant stops the bacteria that causes underarm odour from growing and therefore you shouldn’t smell. Our purest skin-kind deodorant. For Sensitive Skin, it’s based on pure natural mineral salts that provides day-long protection without causing underarm irritation. This is a pure stick with no other added ingredients. As with most natural deodorants, it took a few days to get my body used to just the simple ingredients. Generally it seemed good to use. I didn’t feel too wet and sweaty even if I’d been for a quick walk at lunchtime. And the amount left in the push up pack hasn’t gone down despite me using it for months. But I did find that after doing walking, or getting hot, I could smell myself. No-one else commented so maybe it wasn’t too bad, but it wasn’t pleasant for me. Because you need to apply it on freshly washed pits, reapplying in the middle of the day isn’t really practical. I didn’t find the spray that great because it was so light. Handy for a top up, but a bit pointless if you wanted to smell fresh rather than just of you. I have played a bit of tennis wearing it, and didn’t notice my armpits feeling sweaty, but I was a bit sweaty smelling afterward. I don’t think Pitrok would cope if I was back dancing again, or in the heat of the summer. Smelly armpits aren’t great for clothes either – it means I can’t wear tops a second time if I’m a bit whiffy. If you’re not a sweaty person, Pitrok would probably be fine for you. For me, I want to get a whiff of fresh smells. I noticed they do have a women’s fragranced version now, so maybe that would be better. My second find was Native. They make natural deodorants in a stick form with a variety of scents. From cucumber and mint, to lavender and rose, plus men’s scents or unscented. This was more my thing given the ‘fresh’ scent was always my favourite of my old deodorants. I don’t mind a stick deodorant although I’m always a bit wary of white marks on dark tops. Native deodorants only have safe vetted ingredients, no nasties and similarly to most natural deodorants aren’t tested on animals. You can apply any time, so there’s no worry about topping up if needed. I ordered a pack of 3 to try out different scents (plus if I ordered 3 rather than 2 I got a free travel size one thrown in), thinking I could give that one for N for when he needs to start using deodorant. So far I’ve been really happy with Native. I’ve only used the cucumber and mint one, but it goes on nicely, doesn’t flake or clump, and even at the end of the day I can still smell a bit of the deodorant rather than me. Because it’s a dry deodorant rather than going on wet like the Pitrok, I’ve not suffered any wetness either. I will need to play some tennis or being in a sticky situation to see how it copes, but so far so good. Because my body was used to using natural deodorant already, changing to Native was an easy transition. I didn’t find I needed to adjust, which they say you can have to if you’re moving from standard versions. The only downside is that like most stick deodorants it does get used quickly. Not like a crystal which lasts a lot longer. Given natural deodorants are so much more expensive than standard versions, you do need to prepare to pay more for them, unless you’re going to make your own. With Native, you can buy a subscription at a slightly cheaper price per stick thank buying individually. Both deodorants I tried were packaged nicely, in recyclable packaging. If you want to be kind to the environment and to yourself, removing the use of non-natural materials, then changing to a natural deodorant is worth a try. So going into the warmer months, I’ll see how I go. I might find I need to use something like antiperspirant towels which help prevent the sweat but are still fairly natural. But for the moment, Native deodorant is working nicely for me. 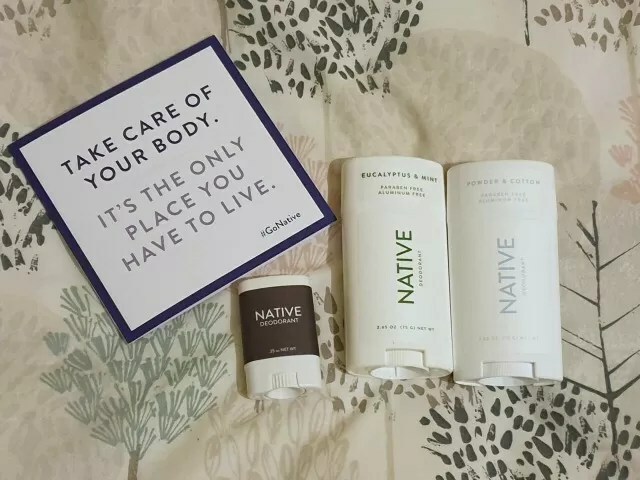 If you want to try it out you can use my referral link here Native Deodorant. Do you recommend any specific natural deodorants?